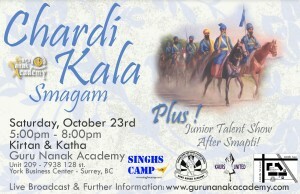 All of the BC community is cordially invited to Chardi Kala Smagam at Guru Nanak Academy on October 23, 2010. 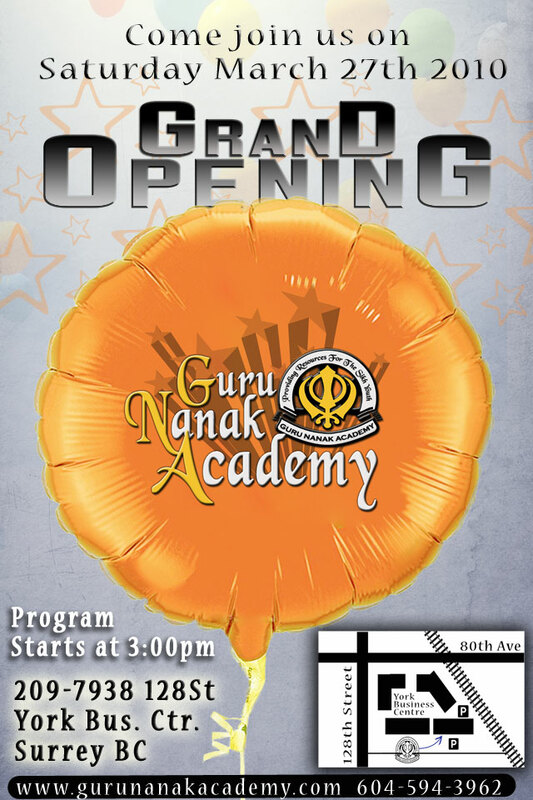 Guru Nanak Academy Tutoring Center will provide students from K-12 help with all course subjects. On top of that tips will be given to students about: note taking, time management, studying, test writing and most importantly how to improve your grades. 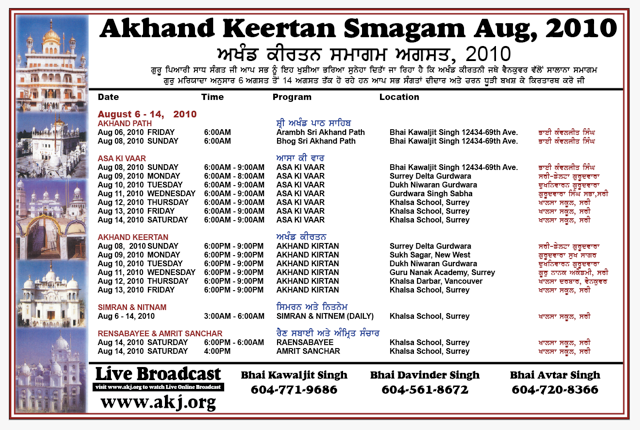 The Annual August Akhand Keertan Smagam will visit Guru Nanak Academy on Wednesday August 11, 2010 from 5:30 pm – 9:00 pm. Waheguroo Jee Ka Khalsa, Waheguroo Jee Kee Fateh! The path of the righteous is sharp and narrow, but the Khalsa would rather follow no other path, than that of truth and faith – where the soul is drenched in God’s name and every action is an expression of divine love! What is the spirit of the Khalsa that enables Sikh activists, volunteers, revolutionaries of the past and present to live their lives and give their lives to protect the rights of others? 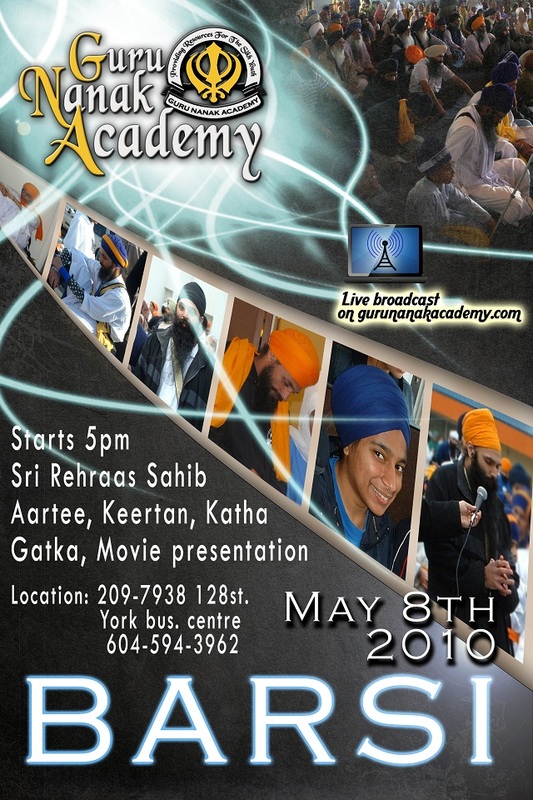 Join us for this special opportunity to celebrate and learn the Khalsa way of life in this unique all-day program celebrating Vaisakhi – revelation of the Khalsa. Jang Prasang means stories of the battlefield – this program will give you insight and inspiration about the external and internal battles in life and how they can be won with the grace of Waheguru and the power of Gurbani. Invite your friends and family! 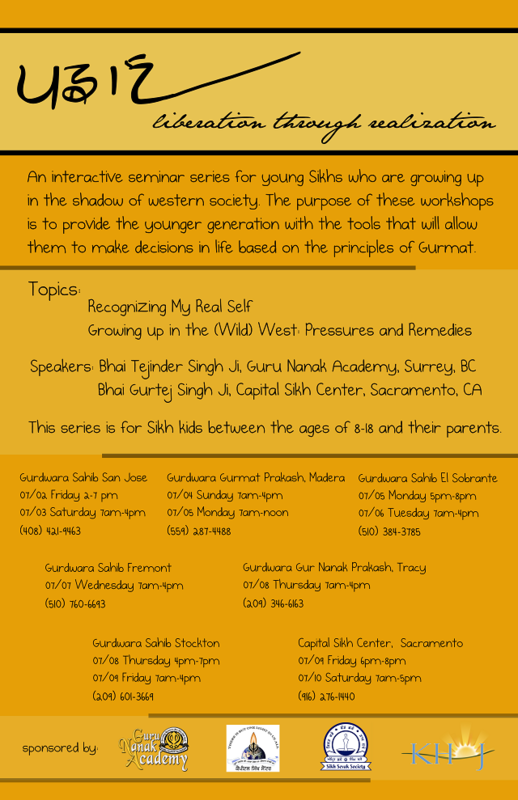 See you there – at Guru Nanak Academy – on April 10th. 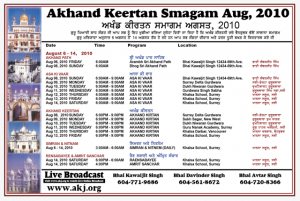 Guru Ji has blessed us with a new location! Join us on March 27th for the Grand Opening Celebration. Click the poster for details. The Month of Maghar is pleasant for those, that take Your virtues (eg.ਦੀਨ ਦਇਅਲਤਾ, ਪਤਿਤ ਪਾਵਨ) and hold them close to their heart (mind), this focus allows them to merge with Param Poojneek Sri Satiguroo Vahiguroo Parmatma. Sri Satiguroo Vaahiguroo Akal Purakh is above karmic law and therefore unmoving, Guroojee is creative designer and creator of the universe, the rest of the whole world is restless and wavering in the 8.4 birth-death cycle because of their karams. Gian: keeping knowledge that the formless Sri Akal Purakh is with you, and Dhian: trying to concentrate through the Shabad and keeping a loving focus that Sri Akal Purakh is within you, then virtues (such as Sat, Contentment, Patience, etc.) come to reside within your heart(mind) through devotional worship; and when the gursikh follows in Sri Akal Purakh’s command then Sri Akal Purakh finds his gursikh pleasing. Guroo Piaaree Satsangat Jeeo, daas was asked at the Academy after the Saturday Program to put up the handout once given on Khat Samptee. Daas chose to write it up instead with a bit more description to help grasp the definition. ਖਟ ਸੰਪਤੀ : Literally just means “the package of 6.” It refers to the goals that one sets in order to achieve spirtual avasthaa through Gurshabad Kamaee. 1. sm – stopping and trying to control the mind away from the temptations and desires set by Maya’s influence. 2. dm – stopping and trying to control the sensory organs from acting on temptations and desires set by Maya’s influence. 3. Srdw – keeping complete faith and devotion in Sri Vaahiguroo. Believing in our Satiguroo’s Words to be the complete truth and that these Words will lead to our salvation. 4. smwDwn – consistently working to collect your concentration and absorbing Gurbani. 6. qiqKCw – keeping within a state of harmony and balance, which is not stirred or affected by the environment when it presents joyous occasions or painful circumstances. 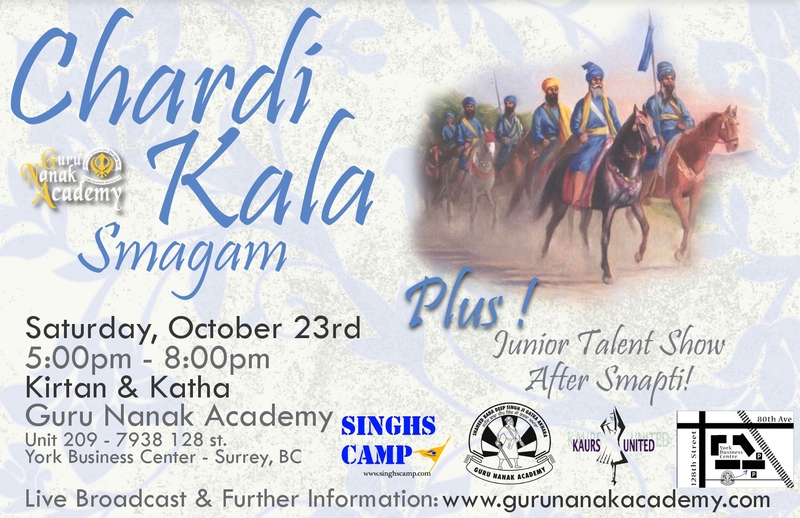 Guru piaaree Khalsa Jeeo, Last Night the Saturday Night program for the Guru Nanak Academy was held at Khalsa School Surrey. Some of Sangat approached daas after and asked for the translation for this param pavittr Hukamnamaa from Satiguroo Vaahiguroo Guroo Granth Sahib Jee Maharaaj Jeeo. This is not a Sikhitothemax translation. The references used in translating this Shabad are as follows: 1. Amrit Ras (Sodhee Jee) 2. Gurvaak Chanan (Baba Hari Singh Randhawa) 3. Sri Guru Granth Sahib Jee Kosh (Bhai Veer Singh). Bhul Chuk Muaaf for any mistakes. Is there some servant of Vaahiguroo (jnu) that can unite (joir) me with my Param Poojneek Satiguroo Vaahiguroo Sachay Patshah Akaal Purakh? Purify (inrml krq) your mind(mnu) and body(qnu) (from the influence of worldy temptations) by making them the field (ikAwro) in which Amrit (=suDw)(the Name of Sri Vaahiguroo Jeeo) irrigates(isMcY), this will be a good union (sMjoir). (Please Sri Akaal Purakh Sachay Patshah Jeeo,) I can only be(hoq) imbued(mgnu) with this(ieAw) pleasure(rs) of your Naam, if You, Vaahiguroo, bless(ikrpw) me by breaking(qoir) my worthless love for this immense (mhw) poison (ibiKAw = Maya). O my beloved Vaahiguroo you are the destroyer of pain(duK BMjn) for the poor(dIn), I have come to Your refuge(srix) and I look(Eir) (with all my hope) towards(qum@rI) You only. My beloved Swamy Vaahiguroo Satiguroo Akal Purakh Jeeo, Your param pavitr Simran (ismrnu) blesses us with a state of fearlessness(ABY pdu), Shaheeda Dey Sirtaj Param Poojneek Sri Guru Arjun Dev Jee Maharaaj Sachay Patshay (using the title of ‘Nanak’) says O Prabhu Vaahiguroo (with your param pavitr Simran), free (Coir) me from the shackles of doubt, pride and arrogance.